I bought one several years ago because I thought it looked neat. Feeding and extracting were problematic. I took it apart recently and like Warden Calloway mentioned, I don't think I've ever seen a more crudely finished firearm. I have mine now where it will reliably feed and extract single rounds, and mostly reliably feed/extract 2. I have kept it as a back up for CC and as a novelty. I wouldn't recommend it as much more than that. I've been using Outlaw bullets, seems like the best price going. I placed an order once while Waimea was on vacation, there was ample warning on the website, and I was in no hurry. My order got lost in the shuffle. Again, no big deal, I wasn't in a hurry and told him so. Imagine my surprise when he threw in 500 free bullets to make up for the inconvenience. Class move if you ask me. Old Slapout is an SASS member (#9198) and a leather worker. http://www.oldslapoutholsters.com/index.html I've bought a few of his lower price accessories; cartridge slides, lever wraps, etc. I've found them to be reasonably priced and well made. I have not tried his holsters or belts. I did the math as well and decided that the fun of shooting a 45 over-ruled the savings of shooting my 38s. I'm not going to win with either so what the heck. I have to admit, I'm not as original as most of you folks. I liked the line in "Unforgiven" where Ned on hearing the alias "Schofield Kid" says "why? are you from Schofield?" Made me want to be the Cibola Kid (I live in Cibola county). Cibola Kid was rejected, so Cibola Al it is. Most just call me Al which is easy for everyone. I tried an Ebay deal through RedDog leather and I can say Paul does excellent work. I now have purchased several items from him and they are all top notch. 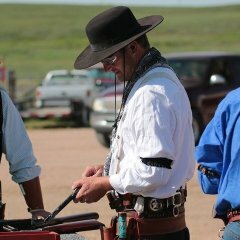 He will do custom work as well as his listed items, so I am having him make a holster from "Packing Iron" for me to use in Classic Cowboy. I know you weren't asking about him in particular, but I wanted to say that just because a maker uses Ebay as a sales venue doesn't mean that they are second rate. I hear what you're saying! I would lean towards the most period authentic holster that I could reasonably manipulate. I used that picture primarily to illustrate the drop. I was actually thinking of having somebody build me a holster in the style of the one Frank James wore except with an inch or 2 of drop to save wear and tear on my old shoulder. I should be clear, those aren't my holsters or guns, the images are from the JM Leather website. They are great looking rigs to my eyes. The rule for CC holsters reads: No Buscadero or drop holster rigs allowed (i.e., part of the grip must be above the belt on which the holster hangs). I was hoping to get by with a slight drop such as these from JM Leather (I intend to use a 7.5" 1875 and the extra inch or 2 would be nice) Technically they are drop holsters, but clearly part of the grip is above the belt. Yay or nay?